Azgar Gataul Mukhamadiev is a dean of Archeology and Ethnology Division in the Kazan State University, Doctor of Historical Sciences (1992), Professor (1993), Corresponding Member of Tatarstan Academy of Sciences (1995 ). 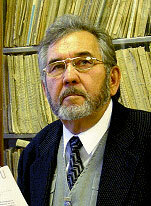 Prof. A. Mukhamadiev was born in 1933 in Bashkiria. In the 1954-1958, A. Mukhamadiev went through a service term in the Military Navy Forces of the former USSR. In the 1963, A. Mukhamadiev graduated Philological and Historical with a double major. His 1992 Ph.D. thesis was "Money System of Itil and Ural Areas in 6th-15th cc." His major teaching disciplines in University are "Basics of Archeology" and Numismatics". 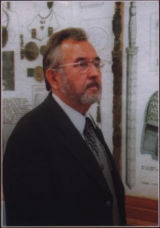 Prof. A. Mukhamadiev's area of studies are writing of Huns, Bulgars, archeology and numismatics. And, A. Mukhamadiev deciphered and was able to read a multitude of extant inscriptions written in Hunno-Kipchak alphabet, a precursor of the famous Türkic Orkhon alphabet. Prof. A. Mukhamadiev published more then 80 scientific works, and 3 textbooks. Prof. A. Mukhamadiev is an expert in history, philology, archeology and oriental numismatics. Bulgaro-Tatar Monetary System in the 12th-15th cc.